TALENTED teenager Ethan Scott is hoping the bright lights of the West End will be beckoning soon. But first, he could be enjoying success of a different kind after the 16-year-old was nominated for a Best of Hartlepool award. It’s fantastic that he has been nominated. He is always getting main parts in shows. He has been singing since he was a baby. The English Martyrs School and Sixth Form College student is now a contender in the young performer category after he was praised for his talent as a singer and actor. Proud mum Leanne Scott, 42, a housewife from the Bishop Cuthbert area of town, said: “It’s fantastic that he has been nominated. 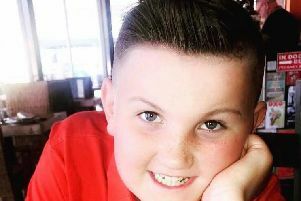 Ethan, who also attends the Amy Richardson Dance School in Hartlepool, has an ambition to perform in the West End one day, said Leanne who is married to Neil Scott, 41. His achievements have included playing Jesus in the college’s production of Jesus Christ Superstar, and Cogsworth in Beauty and The Beast. The nomination added: “Ethan is also extremely committed to developing his performance experience throughout the region, and has performed with Middlesbrough Youth Theatre and at Sunderland Empire. “Ethan was also the winner of the under 18s Hartlepool’s Got Talent 2010 competition. Ethan becomes the latest entry in our Best of Hartlepool competition but we want to hear from many more worthy causes. This year’s awards will culminate with a grand finale at the Hardwick Hall in Sedgefield on April 30 this year. We needs lots of entries and people have plenty of time to put their community heroes forward. They have until April 10 to come forward with deserving causes in categories which range from fundraiser of the year to child of courage, and green champion to local hero. You can nominate by filling in the form in today’s paper or do it online HERE.